The task of the accuracy increase in navigational information is considered. For this purpose the Radio-Distance System (RDS) has been used, ensuring correction of the readings of inertial navigational system (INS). The solution of this problem ensures minimum zone of errors in the coordinate information by rational allocation of ground-based distance finders’ transmitters in the region of landing area. The selection of optimum group of ground-based radio beacons has permitted to reduce essentially the influence of the geometrical factor on the accuracy of navigation, depending on three-dimensional location of the Orbiter. the airfield landing without using engine in automatic mode with high accuracy. The indicated features have essentially increased the specifications level of accuracy of registration of parameters of BURAN Orbiter’s location and velocity in 3-D space. At that, the radio-correction of INS readings at the stage of descent is possible only at altitudes under 50 km, when the process of plasma formations hindering the radio waves passing is completed. At the indicated altitude, the errors of an independently working INS can make tens kilometers for coordinates and tens meters per second for speed. The Radio-Distance System (RDS) along all trajectories of motion, from altitude of 40 km, remoteness of 400 km from the landing area and up to altitude of 4 km allows to execute INS correction with a high level of accuracy. It has been done the analysis of navigational means, existing at that period and traditionally used in air systems of navigation and airplanes landing. As the results have shown, that means did not meet the set requirements, and also did not allow to decide the problem of the 3-D navigating at simultaneous maintenance of a high accuracy and a circle visibility of navigation measuring means. The RDS usage from the altitude of 40 km as the basic approach-correcting navigational means has allowed to reduce errors in coordinates to 300…500 m and for the velocity vector components to 5 m/s at the approach beginning. At the altitude of 4 km these errors are decreasing to 100 m for coordinates and to 3 m/s for velocity correspondively. The scientific and technological problem of optimization of ground-to-board system’s characteristics was determined by the necessity of obtaining high-precision navigational information on the basis of complex usage of inertial navigational system, radio measuring corrective means and mathematical methods of information processing. Radio-Distance Finders (RDF), placed on surface of the Earth in reference Radio Navigational Points (RNP), are used as radio meters. The Orbiter’s position vector in rectangular coordinate system OXYZ (Fig. 1) may be determined as a result of measurements by three inclined ranges (di, dj, dk). These parameters are the distances from Orbiter to the appropriate RNP group (with numbers i, j, k). The measurement by an on-board equipment of inclined ranges up to RNP under the actual operation conditions is made with measurement errors Δdl (l = i, j, k), which are stipulated by errors onboard and ground equipment, and also propagation conditions of radio waves. The measurement errors result in the uncertainty zone of Orbiter’s 3-D position in the chosen reference system. The development of fundamental theory of such system creation makes it possible to minimize the zone of information errors. This problem has demanded more complete registration of sources of measurement errors and designing a complex navigational system, ensuring not only a compensation of methodical and instrumental errors, but also essential reduction of geometrical factor’s at navigation. We shall consider the basic principles of the navigational system integration on the basis of ranging measurements. The ranging way of coordinates setting is well known method of navigation. It consists of detection of cross points of surfaces of position of constant distance by results of distances’ measurement between the Orbiter and radio range finders, located on surface of the Earth around the aerodrome of landing. Generally there can be a number of cross points of surfaces of position, and then the task of coordinates setting of position becomes ambiguous. For the unambiguous solution, it is necessary to take into account the flight direction and arrangement of Radio Distance Finders on surface of the Earth and relative to the orbiter. The cross point of three spherical surfaces of position corresponds to the space position of the Orbiter. However, Δdl errors result in inaccurate definition of surfaces’ position, and the position of the Orbiter is determined not by a point, but by an area or zone of coordinate information errors in the chosen reference system. The zone of errors represents a composite spatial figure, limited by six intersected spherical surfaces with centers, conterminous with installation sites of radio range finders on surface of the Earth. The sizes and configuration of the zone of errors essentially depend on such geometrical factors, as basic distances between Radio Distance Finders, installed on surface of the Earth, their number, the orbiter distance from RDF, altitude of flight, etc. To obtain the solution of such multi-factor problem, it was necessary to receive analytical correlation, determining the ratio between measurement errors of range distances and geometrical factor of ‘Orbiter - RDS’ system. The illustration is displayed in Fig. 2, where is the cross-section by a vertical plane of a 3-D figure, formed at intersection of four spherical surfaces of position corresponding to ranging measurements up to two RNP. As it is visible from the figure, sizes and configuration of zones of errors essentially depend on geometry of the Orbiter and RNP relative position. At that sizes and configuration of zones of errors change the more considerable, the less is the angle α (α = εi − εk), under which the surfaces of position are intersected. At small values of α (the decreasing of altitude of flight H at small elevation angles), the influence of geometrical factor appears essential, and the errors of altitude determination sharply increase. The task is complicated at small altitudes, small elevation angles and range distances of the Orbiter, when they are much exceeding the basic distances between ground-based Radio Distance Finders. The superposition between the measurement errors of navigational parameters and errors of position-fix of the Orbiter is upset. Therefore, there is a non-linear effect of the geometrical factor on enough small values of elevation angles. 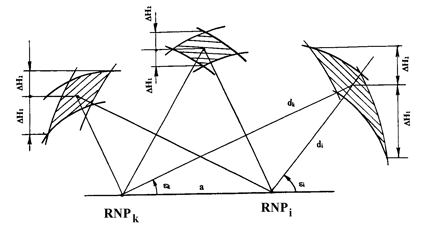 The essential influence, which the geometrical factor exerts on accuracy of parameters of motion determination, causes the necessity of detailed research on correlation of geometrical characteristics of RNP system with accuracy of navigational information. The rational choice of number and scheme of ground-based RDS arrangement relative to the landing area allows to decrease essentially the geometrical loss of accuracy – increase of the error of coordinates setting as contrasted to the errors of ranging measurements. At a ranging method of Orbiter position-fix, the influence of the geometrical factor depends on particular values of the geometrical characteristics (Rr, a, H, Q, etc.). The necessity of a high-level accuracy maintenance at any possible ranges of Orbiter from the landing area sets conflicting objective to the scheme of RNP arrangement. On the one hand, it is necessary to increase the basic distance between RNP, which allows to increase accuracy of altitude determination at the distances of Rr >> a, at the expense of higher accuracy of horizontal coordinates detection. 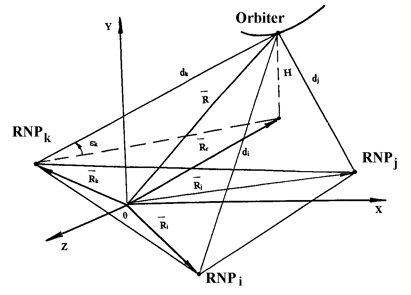 On the other hand, the basic ranges between RNP are desirable to be reduced for obtaining a high-level accuracy at distances Rr << a, where the determining geometrical characteristic is the distance from Orbiter up to nearest RNP. Therefore, the problem may be solved by implementation of algorithm of choice of optimum RNP group on board of Orbiter. As an example, in Fig. 3 for different angles of approach (0…90o) and fixed distances are displayed relative to errors of altitude of flight detection according to the results of measurements prior different groups (triple RNP) at total RNP number equal to five. In the same figure, the line of minimum errors of altitude of flight determination (Hmax)min , obtained with application of algorithm of choosing optimum RNP triples is shown. As a result of the accomplished researches, the basic problems of optimum arrangement of minimum necessary amount of Radio Distance Finders on surface of the Earth were solved in view of probable flight trajectories and features of a relief of terrain for main and alternate airfields. 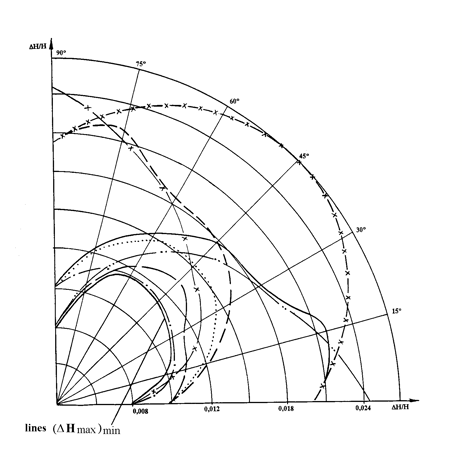 Besides, the onboard processing scheme of measurements, which were taking into account the influence of the geometrical factor were developed, and the integration of radio measuring systems with systems, operating on the basis of other physical principles (integration of inertial system and a radio ranging system), was provided. At realization of analytical calculations and mathematical simulation, different schemes of ground-based radio beacons allocation relative to the landing area were researched. The schemes containing over 24 radio beacons, symmetrically arranged along the circle relative to runway, and up to 5 radio beacons, located around the landing area, were considered. At that, the scheme of arrangement of 6 radio beacons around the landing area, ensuring the necessary accuracy of navigation, was developed and implemented for BURAN Orbiter. In the accepted scheme, two radio beacons are located along the axis of the landing runway symmetrically relating to center of the band and 20 km apart. Four radio beacons are located in tops of a square, entered into a circle (radius of 54 km) with the center conterminous with the runway center. 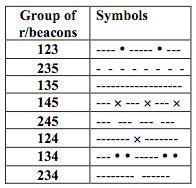 The simple enough scheme of ground-based radio beacons arrangement, ensuring a high-precision navigational information at their minimum necessary number, was obtained. It has resulted in decreasing costs of creation of the landing complex as a whole. The whole cycle of these rather intricate and labor-consuming activities was started from the theoretical substantiation and choice of engineering decision. Then mathematical simulations development, multifold simulation, stand development and carrying out tests under the real operation conditions were done. As a result preparation and issue of the conclusion on usage of the system in test flight of BURAN Orbiter was executed by group of specialists from Navigation Department, directed by Dr. Nekrasov O.N. Dr. Scharensky V.A., Risenberg V.Kh., Mrs. Ogneva V.V., Mr. Proschitsky I.P., Yeryukov A.M. took part in the work. At many stages of system simulation and development Mr. Brovkin A.G., Golubev Yu.V. (MOKB MARS), Mr. Guskov A.D., Vozgilevich I.F. (NPO AP), Mrs. Kuzmina N.A. and Mr. Zhukov A.S. (LII) were actively participating. The registration technique of influence of the relief of terrain and geometrical factor on the RDS arrangement on surface of the Earth was used in three surveying expeditions work and essentially influenced the choice of alternate airfields. Experts of NPO MOLNIYA practically applied the obtained results in their work in surveying commissions, headed by former cosmonaut Popovich P.R., General (former pilot) Mikoyan S.A. and General (former cosmonaut) Titov G.S. As a result of the accomplished works, the alternate airfields for BURAN orbiter landing were chosen and the schemes of ground-based Radio-Distance systems arrangement within the zone of these airfields was developed. Presently, works are accomplished at NPO MOLNIYA on designing new aerospace systems with usage of satellite navigating. It was found out that the problem of optimum choice of GPS satellites constellations for precise orbiters’ position-fixing can be successfully solved on the basis of results of optimization of the geometrical factor influence. Therefore, the results, obtained at research on ground-based RDS measuring and used in BURAN Orbiter Guidance system, may have application to further development.